Watson completed 29 of 49 attempts for 235 yards, one touchdown and one interception Saturday against the Colts. He also carried eight times for 76 yards in the 21-7 loss. 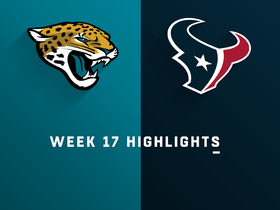 Watson connected on 25 of 35 passes for 234 yards and added 66 yards and a touchdown on 13 carries during Sunday's 20-3 win over the Jaguars. Watson completed 29 of 40 passing attempts for 339 yards, two touchdowns and no interceptions in Sunday's 32-30 loss to the Eagles. He added two more scores and 49 yards rushing on eight attempts. Watson completed 22 of 28 passes for 294 yards and two touchdowns while adding four carries for 26 yards in Saturday's 29-22 win over the Jets. Analysis: The Texans were completely one-dimensional Saturday -- Watson's 26 yards led the team in rushing -- as Lamar Miller (ankle) exited during the first drive of the game, but Watson still averaged 10.5 yards per pass attempt. The young quarterback was sacked six times yet managed to lead a game-winning drive late in the fourth quarter and had seven scoring drives in total. The 23-year-old hasn't thrown an interception since Week 11. He matches up against the Eagles' injury-laden secondary next week. Watson completed 27 of 38 passing attempts for 267 yards and a touchdown in Sunday's 24-21 loss to the Colts. He also rushed for 35 yards on five carries. Analysis: Watson led three touchdown drives on the day, but Alfred Blue and Lamar Miller took two of them in from short distances. The 23-year-old found DeAndre Hopkins over the middle for a seven-yard score in the fourth quarter to draw within three points, but the Texans were unable to complete the comeback. Despite the loss, the game marks Watson's best passing effort since Week 5. The Texans head to New York to take on the Jets in Week 15. Watson (right shoulder) practiced fully Thursday. Analysis: Watson's limitations Wednesday appear to have been maintenance-related and the signal caller -- who has led his team to nine straight wins -- is slated to start Sunday's game against the Colts. Watson's 3,031passing yards through 12 games rank 14th in the league, but he's helped out fantasy players with 375 yards on the ground (fourth among QBs) and a pair of rushing scores, while carving out a respectable 21:9 TD/INT ratio in that span. Watson was listed as a limited practice participant Wednesday due to a right shoulder injury. Analysis: Despite opening Week 14 preparations with restrictions, Watson doesn't appear in serious danger of missing Sunday's game against the Colts. The quarterback has led the Texans to nine straight wins, completing 69.4 percent of his passes for 8.4 yards per attempt and a 16:6 TD:INT over that span. He's also added to his overall fantasy value during the winning streak with 255 yards and two scores on the ground. Watson completed 22 of 31 passes for 224 yards and a touchdown while adding 30 yards on seven rushing attempts in Sunday's 29-13 win over the Browns. Analysis: Watson hit all eight of his first-quarter passes, including an 11-yard touchdown to Jordan Thomas which put Houston up 10-0. The Texans didn't ask much of their quarterback in the second half after taking a 23-0 lead into the locker room, but Watson still did enough to lead his team to its ninth straight win ahead of a Week 14 clash with the AFC South rival Colts. Watson completed 19 of 24 passes for 210 yards and two touchdowns in Monday night's 34-17 win over the Titans. He also rushed eight times for 71 yards and another score. Watson completed 16 of 24 passes for 208 yards, a touchdown and two interceptions in Sunday's 23-21 win over Washington. He added seven yards on three carries. 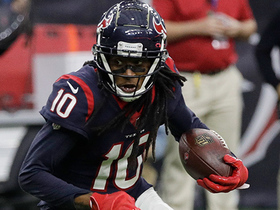 Analysis: Watson connected with DeAndre Hopkins for a 16-yard touchdown in the first quarter to take a 10-0 lead. Houston's offense found limited success thereafter, but a defensive touchdown helped the team hold on for its seventh straight win. Watson hasn't reached 250 passing yards in any of his past five starts, but he'll bring an 18:9 TD:INT into a Week 12 clash with the Titans. Watson completed 17 of 24 pass attempts for 213 yards and two touchdowns, adding 38 rushing yards on six carries during Sunday's 19-17 win against Denver. Watson will fly with the Texans to Sunday's game at Denver, Sarah Barshop of ESPN.com reports. Watson has been sacked once and hit six times over the past two games, Aaron Wilson of the Houston Chronicle reports. Watson completed 16 of 20 passes for 239 yards with five touchdowns and no interceptions in the Texans' 42-23 win over the Dolphins on Thursday. He also rushed once for 14 yards. Texans coach Bill O'Brien doesn't expect Watson to need a bus for transportation to any more games this season, James Palmer of NFL Network reports. Watson completed 12 of 24 passes for 139 yards with a touchdown and no interceptions in the Texans' 20-7 win over the Jaguars on Sunday. He also rushed seven times for 13 yards. Watson couldn't fly with the Texans to Jacksonville on Friday night in advance of Sunday's game due to concerns about his partially collapsed lung, Jay Glazer reported on "Fox NFL Sunday." Analysis: Instead, Watson took a 12-hour bus ride to Jacksonville to join his teammates. While Watson was left off the Texans' injury report after practicing fully, this tidbit should serve as a subtle reminder about the kind of pounding the quarterback has taken this season. Watson (chest) was a full participant at Wednesday's practice. Watson completed 15 of 25 passes for 177 yards with a touchdown and two interceptions and added two yards on two rushes in the Texans' 20-13 win over the Bills on Sunday. He also fumbled three times, losing one. 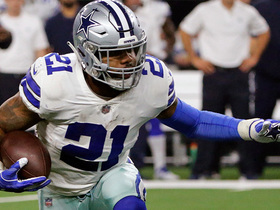 Watson is currently playing through a cracked rib and a bruised lung, and he initially suffered a partially collapsed lung in a Week 5 overtime win against the Cowboys, Fox's Jay Glazer reports. Analysis: Watson's injuries were more serious than initially disclosed, though he'll still play Sunday against the Bills. However, this report underscores how uncertain how fragile his health is heading into the contest. Watson (chest) is listed as active for Sunday's game against the Bills. Watson (chest), who is listed as questionable, is expected to start Sunday against the Bills, Adam Schefter of ESPN reports. Analysis: Watson has taken a beating this season, so this may not be the first time he carries an injury designation into a game. The second-year signal-caller has been sacked 18 times -- tied for third-most in the league -- and has absorbed a league-high 53 hits. The Texans limited Watson's reps in practice all week, but he's not expected to face any restrictions come Sunday. Watson (chest) is listed as questionable for Sunday's game against the Bills. Watson (chest) was limited once again at practice Thursday. Analysis: Watson has expressed no doubt about playing Sunday against the Bills, a notion that would be solidified if he approaches the contest minus an injury designation, a plausible outcome once the Texans release their final Week 6 report Friday. Watson (chest) was listed as a limited participant at Wednesday's practice, Aaron Wilson of the Houston Chronicle reports. Analysis: Despite his limitations Wednesday, Watson said prior to the session that he would "for sure" play Sunday against the Bills. While it's expected the quarterback will suit up in Week 6, it remains to be seen if he'll be given a questionable tag Friday or get removed from the Texans' injury report altogether by the end of the week. Watson (chest) said he "for sure" plans on playing Sunday against the Bills. Analysis: Watson picked up the chest injury during Sunday's 19-16 overtime triumph over the Cowboys, with the Texans labeling the quarterback as day-to-day Tuesday. The quarterback may still be limited some at practice the next few days, but it looks like he'll play through his chest issue in Week 6, barring any setbacks. Watson sustained a chest injury in Sunday's 19-16 overtime victory over the Cowboys and is considered day-to-day heading into the Week 6 matchup with the Bills, Aaron Wilson of the Houston Chronicle reports. Watson completed 33 of 44 passes for 375 yards with one touchdown and one interception during Sunday's 19-16 overtime victory over the Cowboys. He also rushed 10 times for 40 yards. Watson completed 29 of 42 passes for 375 yards, two touchdowns and an interception during Sunday's 37-34 overtime win over the Colts. He added 41 yards and a touchdown on six carries. Watson completed 24 of 40 passes for 385 yards, two touchdowns and an interception while adding 36 yards on five carries in Sunday's 27-22 loss to the Giants. Watson has been sacked seven times and hit a league-leading 21 times over the first two weeks of the season. Watson completed 22 of 32 passes for 310 yards, two touchdowns and an interception during Sunday's 20-17 loss to Tennessee. He added 44 yards on five carries. Watson completed 17 of 34 yards for 176 yards, a touchdown and an interception. He added 40 yards and a fumble on eight carries during Sunday's 27-20 loss to New England. He briefly left the game with cramping, Sarah Bishop of ESPN reports. Watson completed three of six passes for 15 yards with no touchdowns and one interception in the Texans' 21-20 preseason loss to the Rams on Saturday. He also rushed once for five yards. Watson completed five of eight passes for 73 yards with a touchdown and no interceptions in the Texans' 16-13 preseason win over the 49ers on Saturday. Coach Bill O'Brien said Watson will have a similar workload in Saturday's preseason game against the 49ers as he had in the first exhibition game, Aaron Wilson of the Houston Chronicle reports. Analysis: Watson was in for one drive in the preseason opener against the Chiefs, completing his only pass for four yards. The second-year pro is coming off a torn right ACL that sidelined him for the final nine games of the 2017 season, so any preseason workload, albeit small, proves he's on track to start Week 1. O'Brien also added that the starters are getting plenty of practice reps, and it's clear he doesn't want to risk injuries for Watson or the team's other starters. Watson (knee) took part in practice Tuesday with "no brace, moving easy, and throwing with accuracy," Albert Breer of TheMMQB.com notes. Analysis: Watson tore his right ACL in Week 8 of the 2017 season, but his subsequent rehab and recovery has gone smooth and the fact that he's already seen preseason action and is able to work without a brace at this stage is highly encouraging. In the absence of any setbacks, Watson -- whose star was on the rise before his injury -- is on track to be good to go to start the coming season, at which point he'll look to pick up where left off last year. Watson said he wasn't feeling any adverse effects following Thursday's preseason opener against the Chiefs, Aaron Wilson of the Houston Chronicle reports. Analysis: The preseason opener was Watson's first game action since tearing his anterior cruciate ligament last season. He played just five snaps and was upbeat when he returned to practice Saturday. "I feel good," Watson said. "Didn't really play too long, so it was decent. I just played five snaps, handed the ball off, threw one pass." Watson should get more reps in the second preseason game, Saturday at home against the 49ers. Watson played one series in the Texans' 17-10 preseason win over the Chiefs on Thursday, completing his only pass for four yards. Watson is on track to play in Thursday's preseason game against the Chiefs, though Texans coach Bill O'Brien acknowledges he hasn't made a final decision, Aaron Wilson of the Houston Chronicle reports. Analysis: O'Brien likely will reveal his decision once he's done formulating the gameplan for Thursday. Regardless of his status for the preseason opener, Watson doesn't seem to be in any danger of missing Week 1 of the regular season. He's been a full participant in practice since the outset of training camp, with no report of any limitations or setbacks with his knee so far. Watson handled first-team reps at Thursday's practice, Ian Rapoport of NFL Network reports. Analysis: Watson handled everything but 11-on-11 drills during the offseason program, so Thursday's development is the most-recent positive sign for his recovery from a torn ACL in his right knee. It's unclear if he slipped on a sleeve or brace, which he alternatively has donned in recent months. As he ramps up his workload further, the last question that remains is when he'll see game action. Watson (knee) said he will be a "full-go" for the start of training camp, NFL.com reports. Analysis: Watson participated in everything besides 11-on-11 work at June minicamp, doing so without the assistance of a knee brace. He plans to ramp things up for the start of training camp, potentially returning to full practice participation less than nine months after tearing the ACL in his right knee. Even if he ends up being eased into practice, the 22-year-old quarterback clearly is on track for Week 1, with a shot to see some action during the preseason. Watson (knee) practiced without a brace at mandatory minicamp this week, John McClain of the Houston Chronicle reports. "The knee is doing good," Watson said Wednesday. "For the nine-week goal we put in from the beginning [of the offseason program], I'm pretty much where I wanted to be. 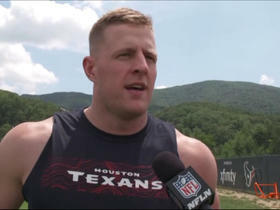 Kind of passed it inside in the weight room, mentally and also on the field, so everything's going smoothly right now." Watson (knee) is not expected to open up training camp on the PUP list, Ian Rapoport of NFL Network reports. Analysis: This is a very positive development for the starting quarterback, as his anticipated absence from the PUP list at the start of training camp suggests that Watson is very close to being back to 100 percent. Watson has participated in throwing drills during OTAs and should see his workload increase as training camp draws closer. Watson (knee) was seen participating in throwing drills during OTAs on Tuesday, Aaron Wilson of the Houston Chronicle reports. Texans coach Bill O'Brien said Watson (knee) is on schedule to participate in training camp, NFL Network's Will Selva reports. Watson continues to progress well in his recovery from a torn right ACL, ESPN's Mike Reiss reports. "Deshaun's ahead of schedule, but there's still a lot of work," coach Bill O'Brien said Tuesday. "He has a great idea how he feels and how his knee is. He knows the stages he needs to get back on the field." Watson was seen running without a knee brace on the field at the Texans' practice facility Thursday, according to J.J. Watt's Twitter account. Texans head coach Bill O'Brien said Wednesday that Watson remains ahead of schedule in his recovery from surgery to repair a torn ACL in his right knee and believes the quarterback will be available in some capacity for Organized Team Activities, Aaron Wilson of the Houston Chronicle reports. Watson (knee) resumed running Monday, per his personal Twitter account. 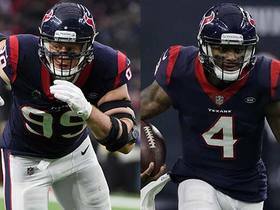 Coach Bill O'Brien indicated last week that Watson (knee) is ahead of schedule and could be available in some capacity during the Texans' Organized Team Activities, Sarah Barshop of ESPN.com reports. Texans head coach Bill O'Brien confirmed Tuesday that Watson (knee) is ahead of schedule in his recovery from a torn ACL, Drew Dougherty of the Texans' official site reports. Watson (knee) said Tuesday that his rehab is "on the right track" following his Nov. 8 surgery to repair a torn ACL, Sarah Barshop of ESPN.com reports. Watson (knee) underwent successful surgery Wednesday to repair his right ACL, Adam Schefter of ESPN reports. Watson will undergo surgery Wednesday to repair his torn right ACL, Mike Garofolo of NFL Network reports. Analysis: The Texans moved Watson to injured reserve shortly after he suffered the injury on a non-contact play during practice Nov. 2, spelling an end to what had been an outstanding rookie campaign. Watson is expected to require 8-to-9 months to recover from the procedure, which could result in him being limited when training camp opens next summer. Assuming Watson endures no significant setbacks, however, he should be on track to open the 2018 campaign as the Texans' starting quarterback. Watson's recovery from a torn ACL in his right knee is expected to last 8-to-9 months, Adam Schefter of ESPN reports. 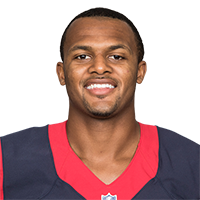 The Texans have placed Watson (knee) on IR. Watson is slated to undergo season-ending surgery after tearing his right ACL during Thursday's practice, Chris Mortensen of ESPN reports. It has been confirmed that Watson tore his ACL on Thursday, both Adam Schefter of ESPN and Mike Garafolo of NFL Network report. There are fears that Watson suffered a torn ACL during Thursday's practice, Ian Rapoport of NFL Network reports. Analysis: Per the report, Watson suffered a non-contact injury Thursday, with an MRI on tap to determine the extent of his knee injury. 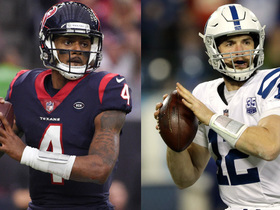 If an ACL tear is confirmed, Watson would be done for the season, which would set the stage for Tom Savage to reclaim the Texans' starting QB job. Watson was listed as a limited participant in Thursday's practice due to a knee injury. 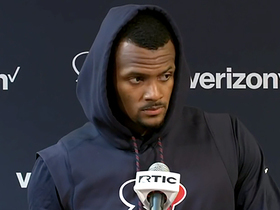 Houston Texans quarterback Deshaun Watson embraces the challenges to come in the 2019 season along with staying healthy. Take a look at the best runs around the NFL from Wild Card Weekend. 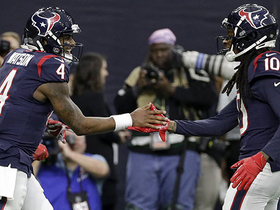 NFL Network's James Palmer discusses the incredible chemistry between Houston Texans quarterback Deshaun Watson and wide receiver DeAndre Hopkins. 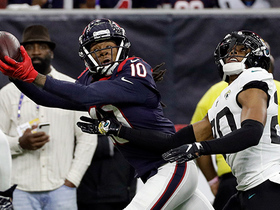 Houston Texans wide receiver DeAndre Hopkins shows unreal reflexes on 13-yard catch of a deflected pass. 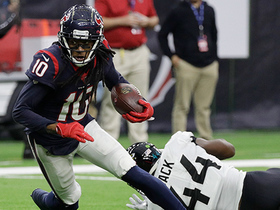 Houston Texans wide receiver DeAndre Hopkins sheds Jacksonville Jaguars cornerback Jalen Ramsey for 18-yard catch and run.